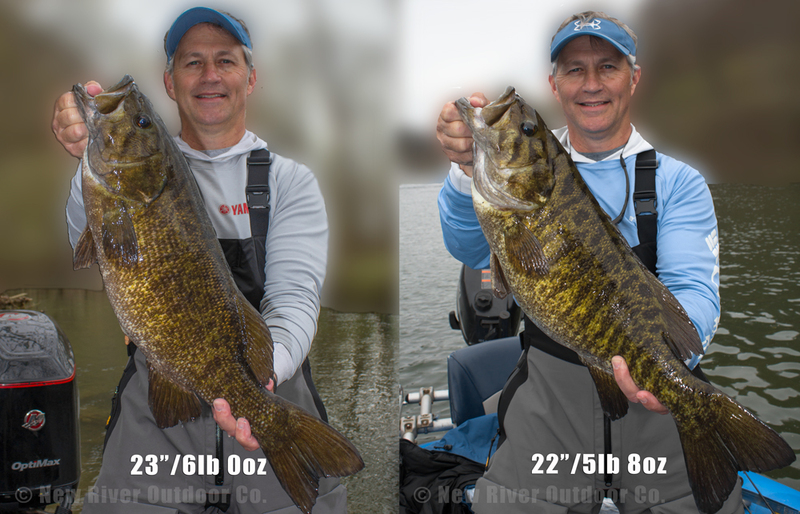 "Your guides to Trophy New River Smallmouth"
New River Outdoor Co. is located in Pembroke, Virginia (25 min. west of Blacksburg/Virginia Tech). All of our guided smallmouth trips are run on the New River, recognized as some of the best smallmouth and musky water in the entire country. Britt and his team of professional guides have plied these ancient waters for decades in pursuit of trophy smallmouth bass and musky. The team tailors each day on the water to their specific clients’ needs and revels in the memories that are made to last a lifetime. Please call (540-921-7438) or email at info@newriveroutdoorco.com for more info or to book a trip. The New River is recognized as the "second oldest river in the world" and is estimated to be between 10 and 360 million years old. Characterized by its extensive ledge systems, deep pools, numerous rocky runs, and plentiful forage, the New River has all the necessary ingredients to garner the ranking as one of the best rivers in the country for producing citation-sized (20" and up) smallmouth. Our "New River Fishing Trips" are run on over 100+ miles of the New River in the state of Virginia. We cater to both spin and fly anglers and run guided trips from March through November. We are equipped with fully outfitted self-bailing rafts with fishing frames. We carry a full array of tackle on every trip and furnish our clients with G.Loomis spin rods and Shimano reels. Bonus fish include walleye, stripers, hybrids, muskie, carp, rock bass, brim, rainbow trout, flathead or channel catfish, largemouth bass, and Kentucky spotted bass; all of which have been caught by our clients on guided trips. New River Outdoor Co.'s guides have years of experience fishing the New River with proven results. Our guide service has been featured in a number of national and regional outdoor publications including Bassmaster, In-Fisherman, Cabelas Outfitter Journal, Woods and Water, Harris' Bass Fishing Annual, Blue Ridge Country, American Angler, Musky Hunter, and VA/WV Game & Fish. Walker Creek Retreat - Walker Creek is a local treasure and the largest tributary to the New River in Virginia. Along nearly a mile of unspoiled creek frontage, Walker Creek Retreat boasts five waterfront vacation rentals that include numerous handmade and Amish touches. Unique floor plans, each with ample space inside and out, make the cabins at Walker Creek Retreat the perfect place for anglers looking to take full advantage of their fishing trip. New River Musky Trips - The New River is an excellent musky fishery and home to the 45lb 8oz Virginia state record. NROC guide Britt Stoudenmire is relentless in his pursuit of these beasts with his best seasons being the winter (Dec thru early-March) and early-summer (May and June). Click here to visit our Southern Musky Guide Service website and learn more about our exciting musky trips. Trophy Galleries - We are very proud of our clients' dedication and accomplishments. Check out our "5lb Club," "Musky Gallery," and "Fly Galleries" for lots of BIG fish and BIGGER smiles. For recent pics and updates, please visit our Facebook Page. In the Print - Our guide service has appeared in over 40 regional and national publications over the last couple of years. Click here to check us out "in the print." Gift Certificates - Looking for a great gift for that avid angler in the family? Give us a shout at 540-921-7438 for more information. © 2019 by New River Outdoor Co. In Memory of Our Dear Friends Cap'n Jack West, Roscoe, and Toby Bell.